Why do predators pick the people they pick? And why do they avoid other people? 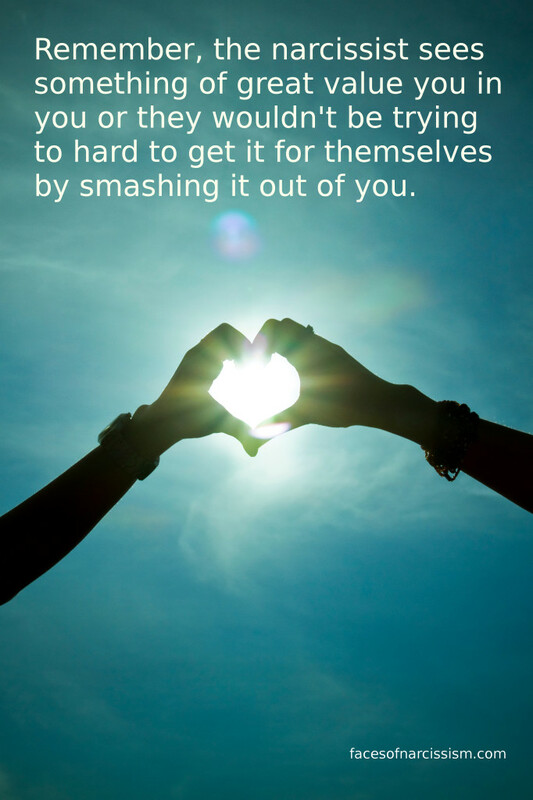 Remember, the narcissist sees something of great value in you or they wouldn’t be trying so hard to get it for themselves by smashing it out of you. For most of my life, I have felt like a magnet for abusive people. I got taken advantage of more than I’d like. I was abused and neglected by my mom, abandoned by my dad, bullied by other students, mocked by my mother’s relatives. I got conned by a carpet cleaning company, charmed by a salesperson at a traveling renaissance show, cheated at a pawn shop, screwed over on a car repair. I married a narcissist, dated a con-artist, married a sociopath. I was sexually harassed by a “nice” old man who pretended to be my friend, actually…sexually harassed a lot from touching to lewd comments, stalked by a woman from a support forum, bullied by an aggressive co-worker, and more. Every time, I said, okay, I must be weak. I am going to be stronger and smarter next time so I don’t get screwed again. And I’d go back to living only to have someone con me again or bully me when I tried to stand up for myself. A few years ago, I posed the question in a group I was in: Why are some people prone to being victimized? One woman said she had never had been sexually harassed. Really? I have even had college professors say creepy things to me and ask how I am in the bedroom. Seriously. Some of my stronger female friends said that no man dared say things to them. But it happens to me a lot. So, I decided to Google, how do bullies pick their victims? How do predators pick their prey? How do abusers pick their targets? Why are these jerks drawn to me?! They choose people with passive body language–because they look submissive and non-confident in themselves and their surroundings. In fact, studies show that a known sociopath can pick out a previous victim from a crowd of people just based on body language. Anyone who’s different – whether that is their looks, weight, accent, clothing or interests. Disabilities make some children an easy target. I was each and every one of those. Ouch! But I know it now. Yay! And that is a big part of why I started this site to document all the things I read and learn on my journey to escape being a target. Now bullies are one thing, but physical predators are another. A predator with a mental illness knows who to go for. This article states, “Psychologists have known for years that human predators select their prey based on signals given off by their potential victims. In a matter of seconds, the predator acquires a sense of who is and isn’t a suitable target. For every victim that is attacked, many more are past [sic] over. What are the criteria that predators use to select their victims? I’ll tell you.” The same article goes on to explain the details of The Grayson/Stein study done with violent convicts. They showed the predators videos of people and asked who would make a good victim, and the predators independently picked the same people! The researchers concluded that the potential victims walked differently–as though they were less confident with themselves and less aware of their surroundings. In romantic relationships, abusers look for all of the above listed qualities, but narcissists in particular also look for people they can leach off of. They want someone attractive, desirable…a prize to show off. They want someone loving and sweet that they can take advantage of. They want someone popular who can boost their own social standing. They want people who have good qualities that they don’t have. Basically, bullies, predators, abusers and jerks are looking for someone who has what they want and someone who will be easy to overcome. Studies show that people who have been victimized once are more likely to be victimized again. Once you’ve been abused, you gain traits and qualities that you might not be aware of…but the predator is! Compared to women with no history of assault, odds of a new assault double for a woman who has been assaulted once, quadrupled after two assaults and were TEN times more likely after 3 or more previous attacks. Statistics are even worse for people who were sexually abused–especially as children. So if you feel like you are being victimized again and again, you probably are. You might have the body language or personality traits predators are drawn to. You might seem vulnerable without a support system. Normal people wouldn’t seek you out, but predators are far more aware of you than you are of them. Next up…learning how NOT to be the target anymore! Excellent. I need to figure out what body language(s) I’m engaging so I can change it. Seriously considering a move to where my family is: either Oklahoma or Tennessee. The only reason I’m still here at this point is Gage and Tristan (and their parents, of course!). Otherwise I’d been long gone by now.